I haven’t said much since this year’s start-up of the LHC, but there have been some interesting developments, so I’ll add one last update. If you haven’t been following the LHC status, it has been exponentially increasing in collision rate while maintaining a fixed collision energy (about 3 pb-1 of 7 TeV collisions have been collected by the LHC experiments, which is a few thousand times less than the Tevatron’s 9 fb-1 of 1.96 TeV collisions, collected since 2001). My “particle body counts” are now completely obsolete: nearly all known particles have been re-discovered in the LHC experiments. And today, the first unexpected effect has been presented by an LHC experiment: “Long-range, near-side angular correlations,” which is presented in detail on the CMS public page. Below the cut here, I’ll explain what this means. … if all goes well. The LHC has been circulating two 3.5 TeV beams off and on for the past week, and tonight they plan to turn off the separators keeping them apart. We should then see the first 7 TeV collisions ever produced in a laboratory. If there are any undiscovered particles with a mass in the new energy range that is being opened up, it would now become possible for them to be spontaneously produced in a detector where we can see them (as opposed to cosmic ray air showers). Our view of particle physics is about to become three and a half times larger than it has ever been. The plan at first is just to let the beams collide without focusing them, so the luminosity will be low, and the rate at which new particles could be produced would be correspondingly low. As time goes on, the beams will be focused and the intensity will be raised, which increases the rate of collisions and therefore the probability of seeing new stuff. This is the beginning of an 18–24 month period of continuous data-taking and open-ended exploration. LHC page 1: live update of machine status. When I last looked, the energy was 3.5 TeV and the beam intensities were 1.5e10 (higher than the past few weeks). The red and blue lines are intensities of the clockwise and counter-clockwise beams versus time. CMS data aquisition: live update of CMS data collection. The main plot is data accumulated versus time; it’s a constant slope for cosmic rays (no LHC beam), but could jump up if we get a lot of events from the beams. CMS event display: pictures of the events as we see them (in three projections: face-on, side view, and 3D). Yellow lines are particle trajectories, red and blue bars are calorimeter energy deposits. If a yellow line goes beyond the calorimeters, it’s a muon! Right now, I think it’s re-playing events from the low-energy collisions of 2009; that will change sometime tonight. In my timezone, the sun is setting. Happy Passover! The yellow boxes are silicon strips that detected the passage of particles (most likely pions in this case) and the green lines radiating from the center are tracks reconstructed from those hits. They’re not constrained to meet at the center: that’s an indication that these particles actually originated where the beams collide. Beyond that, the red and blue bars show how much energy was collected in the electromagnetic calorimeter (electrons, photons, and hadrons) and the hadronic calorimeter (hadrons only), respectively. No activity can be seen in the muon detector (red boxes). This is all consistent with what one should expect from the collision of two protons— a strong (QCD) interaction between the quarks and gluons producing a handful of strongly-interacting hadrons, rather than photons, electrons, muons, or taus, which are insensitive to the strong force. An electroweak interaction between the quarks and gluons, producing possible Higgs bosons or any of a number of other exciting possibilities * * * * * * * *…, are more rare, and will require collecting and sifting through huge numbers of collisions. The CERN twitter site says that all four experiments saw collision-like events. It’s finally happening! In a meeting at Chamonix last week, CERN, the LHC collaboration, and the LHC experiments came up with a 2009 schedule. “Second beams” (as opposed to first beams last year) will start a little later than expected: September 2009 instead of July. Then the goal is to have first collisions at the end of October, making the delay due to The Incident almost exactly one year. At the risk of sounding naive, I think it’s really going to happen this time. The LHC people must know a lot more about the actual behavior of the beams from their real-data test last year, and given how disappointing last year’s setback was, I’m sure they’ll do everything they can to avoid anything like it. In other words, the argument is based on social reasons, not technical ones, but guessing when we’ll have data is a social science. A few days ago, CERN released pictures from the LHC incident. Here’s one from the DG’s talk. There are a few more, plus a video of the repairs, in their press release. This interconnect between two magnets is normally straight. If you add up the energy stored in the magnets during the 5 TeV test, it comes to about 6 MJ, of which 4 MJ was dumped into a system designed to absorb energy on a rapid demagnetization. Unfortunately, 2 MJ is the amount of energy a 3-ton SUV has when it crashes at 90 miles per hour. Twenty-nine magnets need actual repairs, which is not too bad of a load for a factory that built over 1,600 in the past 7 years. A lot of the talks about this focus on new preventative measures to identify spots of high resistance (several more have been found, though they were all within specifications, unlike the one that caused the accident) and to absorb more energy in the case of future accidents. The new start-date for powering tests is the end of June, 2009, with beam again in July (a 10-month delay). In all, 6 tonnes of helium were lost out of the 15 tonnes that were in that sector. The last 4 leaked slowly, before the enclosure could be closed. Again, I’m not a CERN representative, I’m just very interested in the outcome of this project, as may be some of the readers of this blog. 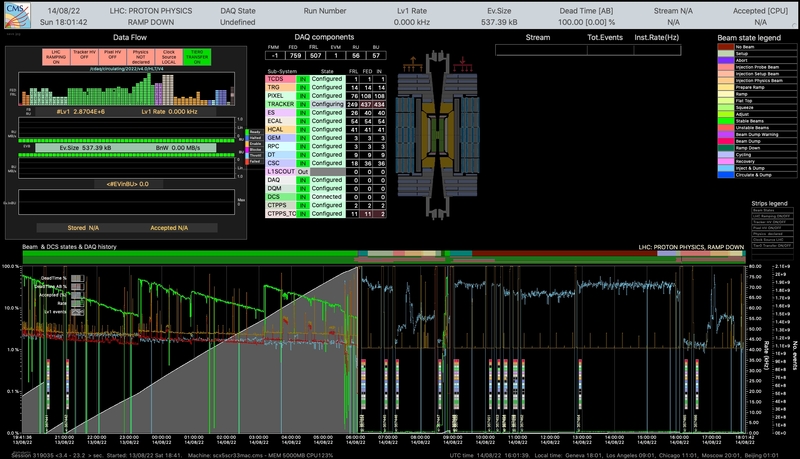 A few days after the first LHC collisions, I dug into our growing dataset and made an animation from the signals we captured in the CMS detector of muons from LHC beam-halo events. The result looks like a computer simulation, but these are real measurements from the detector, observations from 10:33-10:42 PM Geneva-time on September 11, 2008. In that sense, it’s a live video. During this period, LHC beam #2 circulated for 9 minutes, 6 million times around the ring without getting off track. All the cheering on September 10th was about getting the beam to go once around the ring without getting off track. The animation can be found at the bottom of the CMS Media page. Red dots are the signals in the detectors, yellow lines are the best-fit curves through them, representing the path taken by the muons. Notice that the muons are more often vertical when the beam is off (because they’re cosmic rays) and horizontal when the beam is on (because they’re from proton collisions with gas atoms and collimators far upstream in the LHC). The rate also increases dramatically. This is not sensitive information! It is quite reasonable for scientific collaborations to have private information, because they are the kinds of social organizations for whom it would be best for everyone to reveal well-digested information at a late time, but better for an individual, worse for the group, to release exciting information early. We need to control that, with our own good-will preferably, and that’s how it’s currently instituted. The world interest in the LHC, the unprecedented size of the collaborations, and the new existence of blogging introduces a temptation for individual scientists to be self-proclaimed Promethei, and that’s a problem, not a good thing. To illustrate what I mean with a perhaps not-applicable example, do you remember five to ten years ago when large extra dimensions were a new idea? People first started thinking that maybe the hierarchy problem doesn’t exist, and maybe the Plank scale is actually just a few TeV (those of you who are physicists or part-physicists)? Then someone went one step further and said, “well if so, maybe the new particles we’ll see at the LHC will be black holes.” And physicists thought about that and how they would Hawking-radiate in fascinatingly spherical patterns and how that would be cool, but in the end, not consistent with existing observations. Of course no attempt could or should be made to keep scientific discourse like that secret, but when it left the physicists, it became the headline “LHC to Make Black Holes, Eat Earth (page C-1)” and a frenzy that even lead to a death. Somehow that sort of thing happens to ideas and information, and there is strangely no way to reign it in; no amount of truth mops it up. It is utterly reasonable for the LHC collaboration to want to do an investigation before they let their members speak openly about it. I don’t want to be responsible for “LHC Explodes, Experts Say (page E-13).” Given what I know as a nearby outsider, the problem is exactly as bad as the press release says it is: a broken electrical connection, a huge helium leak, and possibly some damage to the magnets. The extent cannot be known until it is investigated. Why is it taking so long? I can guess: a helium-rich environment is an oxygen-poor environment, and the moment they switched on the beams, they turned the tunnel into a radiation zone that will need to be mapped before it can be safely traversed. Of course, I’m also disappointed and nervous, because I have a lot at stake. So do the LHC people. And we all have an interest in carefully-evaluated information; I mean, we’re scientists after all! Nope, the verdict is in: the LHC will not be turned on again this year, even for a shortened 10 TeV run. The restart has been scheduled for early spring of next year, so I’ll probably get very familiar with these 14 minutes of data! One point that I want to set straight is that as far as I understand the term “magnet quench,” this wasn’t a quench. It was an electrical connector between two magnets which failed under the load of 8,500 Amps of current. When a superconducting magnet quenches, a small patch of the superconducting coils heat up over the critical temperature, making it no longer superconducting. It gets warmer, heating up more of the surrounding region, until a runaway effect dumps all of the magnet’s energy into heat and throws things around because strong magnetic fields have just been turned off. This was less exotic: more like a broken fuse or bad wiring (operating at hundreds of times the normal electrical consumption of a household, but still). So that’s probably it for the regular (irregular) posts, at least until “spring.” I should probably sit down and calculate when I’ll next be able to publish a scientific paper. Hmm. How tall do you think a Yeti is? Here’s what happened: as a dry-run for storing a 5 TeV beam (there was no beam in the machine at the time), the dipole magnets which would hold it in its trajectory had to reach a field strength of 6 Tesla. This is an extremely high field, about twice what someone would get in an MRI, requiring huge electrical currents. For some unknown reason (the subject of an ongoing investigation), a connector somewhere shorted, breaking a coolant duct which then sprayed a metric tonne of liquid helium everywhere. When the proverbial smoke cleared around mid-day yesterday, the sector was 80 degrees Kelvin. The delay will take a rather large bite out of the 10 TeV collisions run planned for this year, but it won’t necessarily push back the start of 14 TeV collisions in 2009, since the commissioning of the magnets for full field (8.3 Tesla) is something that has to be done while the beam is not running. This is a blog by three recent and future Cornell graduates. prof dr mircea orasanu on Made in the U.S.A.